Many Pagans find that chanting can help them center and focus before meditation or ritual, but did you know that it can also transform your life? The magickal power of words is recognized in spiritual traditions the world over, and mantras are among the most famous and ancient magickal word formulas. Mantras are a form of magickal prayer-chant that originates in the Hindu tradition. They were designed specifically to have dramatic transformative effects on those that recited them. When said aloud, each letter of the Sanskrit alphabet (which the mantras were originally composed in) creates energetic vibrations that, when combined into spiritually potent phrases can help the chanter attain their goals and desires - or even bring them into contact with the gods! While Hindu & Buddhist tradition holds that most mantras may only be recited by initiates, there are plenty of mantras that have been used and proven to be extremely effective (and safe) by Westerners. Mantras work on the principle of ‘like-attracts-like’. When you are chanting a mantra, you are immersing your body and your environment with the vibrations created by the sounds of the words. If you chant a mantra aloud long enough (about 3-5 minutes for me, but everyone is different) you will begin to feel the energy of the atmosphere around you change. This vibration will match the vibration of whatever goal the mantra was intended to achieve. The longer you chant, the longer you will sustain and release the energy of your mantra-spell out into the Universe where it can manifest. Repetition of the chant on a regular basis is important until you have attained your goal. 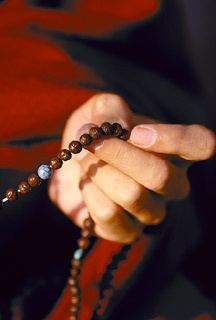 People who decide you use mantras as a regular part of their spiritual practice usually obtain or make a string of japa, or prayer, beads to help them keep track of how many times they have said a particular chant. In the Hindu and Buddhist traditions, mantras are usually repeated in some multiple of the sacred number 108, and so most malas, or rosaries, have 108 beads. How Can Mantras Help Me? OM – By far the most well-known and Universal mantra, it is believed to be the sound of Creation Itself. This mantra is a panacea of sorts, as it can be used in nearly any circumstance. It invokes Divine energy and can open many spiritual doors, and increase your intuitive capabilities. Chanting OM can sometimes trigger clairvoyant experiences or even spontaneous channeling. To direct its energy to a specific task, visualize your desire while chanting. I begin and end all my chanting sessions with a few repetitions of OM, as it fills the energetic atmosphere with a powerful and sacred vibration. OM Shanti! Shanti! Shanti! – This translates into “Hail Peace! Peace! Peace!” and is a wonderful mantra for this hectic (and violent) day-and-age. It is an excellent addition to any magickal workings for Peace that you may participate in. You can use this mantra to calm and center yourself if ever you are feeling overwhelmed with anxiety and worry. Its vibrations can also cleanse and soothe an environment where lots of anger and fighting have been present. OM Mani Padme Hum – This is another well-known mantra, which originates in the Buddhist tradition. It roughly translates, “Hail! Wisdom is in Compassion.” This mantra is used to cultivate the important spiritual quality of compassion, but if necessary it can be used to encourage others to behave compassionately towards you in times of strife. It is also another mantra that can also be used to spread wise and compassionate action Universally, as it evokes the energies of “She who hears the cries of the World”, Kuan Yin. OM GAM Ganapatiye Namaha- This is the mahamantra of the Hindu Deity, Ganesha, Lord of Obstacles. Chanting this can clear away any obstructions, seen or unseen, which are standing in the way of you achieving your goal. I use this mantra more than any other, and have not once been disappointed! Life just seems to flow more smoothly when you chant this regularly. Use this mantra whenever you feel overwhelmed by delays or just generally stuck, and your path will soon be free and unimpeded. OM EIM Saraswatyei Swaha – This roughly translates, “Hail to the Goddess that which enlightens all artistic and educational undertakings!” As you can see, this mantra invokes serious aid to any creative or scholastic project. When combined with a sincere effort to hit-the-books, this can help you pull your self up by your bootstraps and make the grade! It can also be chanted to inspire your artistic talents, or improve your overall academic prowess. This mantra is a powerful talisman for any student! Once you have chosen a mantra that suits your needs, you may want to buy or make a mala, to keep track of your repetitions. Since saying a mantra the traditional 108 times at one sitting can be tough for a novice, the bracelet-sized wrist malas that contain 27 (one quarter of 108) beads are ideal. Decide how often you are going to chant your mantra. Daily practice is recommended if you are working toward a specific aim, but often it is hard to schedule time for meditation every single day. What is important is to make a plan and stick to it. Now it’s time for you to start chanting! How Do I Chant My Mantra? When you are first beginning, experiment by chanting the mantra at different rhythms and tempos, and also at various tones and volumes that are comfortable for your voice. You will probably find that chanting at a medium to slow pace, in the middle to lower register of your voice, at a fair volume will result in the energy of the mantra buzzing around and through you. As soon as this buzz intuitively “feels” right to you, you know you’ve found the correct way to say the mantra for you! Once you’ve been chanting for a few weeks, you’ll become familiar enough with the energetic vibration of the mantra, to be able to effectively chant it mentally. By imagining the vibrations surrounding you while you silently recite your mantra, you are no longer limited to when and where you can chant! 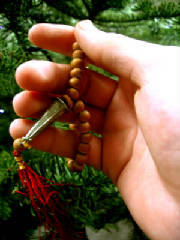 I often use my wrist mala and chant on the subway or streetcar. This makes maintaining a daily practice much easier. What If I Pronounce It Wrong? It is true that correct pronunciation is ideal, but if you mess it up a bit, you’re not going to be hit by a thunderbolt from above! Many websites have audio clips that feature traditional pronunciations and rhythm structures of various mantras. I would recommend listening to these just to get an idea of what your mantra should sound like. I have found, however, that the intonation of the mantra changes from one traditional school to another, and I have personally experienced incredible results using Westernized inflections. Generally, if you take a few moments to sound it out, you will arrive at an effective pronunciation that you are comfortable with and can easily use to attain your goal. There is a Buddhist folk-tale about the spiritual fruits of a laymen’s incorrect - but faithful - recitation of a mantra, wholly surpassing the dogmatically correct –but empty – recitations of the same mantra by a monk. So even the Buddha agrees that earnest effort and a positive attitude is what really matters when chanting a mantra! Mantras, like spells, manifest in their own mysterious timeframe. The exact time it takes will vary from person to person, depending on their goals. In Hinduism, 40 days is the traditional amount of time for the results of mantra repetition to be perceived. However, I have personally had the effects of a mantra manifest in under a week, and the resulting sequence of events that it set off remaining active for months! This reinforces the old adage, “be careful what you wish for, because you just might get it”. While fun and easy to work with, mantras are an ancient and powerful form of magick, so you must be just as sure about your motives and the full consequences of the end-result before beginning to chant, as you have to be before casting a spell. If you would like to experiment with adding mantras to your magickal toolbox, I would suggest making your first goals simple ones, until you get the hang of how to work with this particular piece of Arcanum. Happy chanting!